Preheat oven to 350°F. Line the muffin baking tin with paper liners. In a large mixing bowl, add chopped chocolate and cocoa. Pour the hot coffee/ water and mix well until smooth. Set aside to cool completely or refrigerate to cool. I set it aside for about 15-20 minutes on the counter. In the meantime get all the other ingredients together for the cake batter. Whisk bread flour, salt, sugar and baking soda in a medium bowl and set aside. In a measuring cup, whisk together oil, eggs and vanilla. Pour this mixture on to the cooled chocolate and mix well. Finally add the flour mixture to the chocolate mixture and mix well until smooth. Divide the batter evenly in the prepared muffin pan, pouring to about ¾ full. Bake for 17 - 20 minutes or until a toothpick inserted in the center of the cupcake comes out only with very few crumbs. Remove from the muffin pan after 5 minutes and cool completely on a wire rack before frosting. 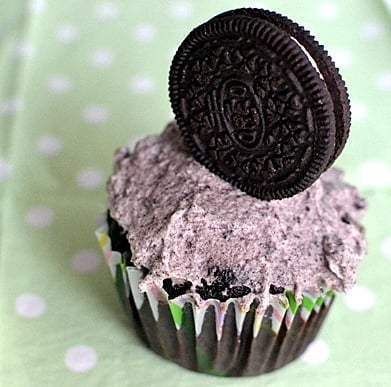 For the frosting: Blend the oreo cookies in a food processor into very fine powder, make sure that there are no pieces visible. Whip the heavy cream with confectioners sugar in a stand mixer with whip attachment or with a hand mixer until stiff peaks form. Add vanilla and the oreo cookie powder, mix very gently to incorporate. Put the frosting in a piping bag with a decorative tip and pipe on to the cupcakes (or if you are like me just smear using a spatula or bread knife). Decorate with extra oreo cookies on top.